I will now be meeting with the brilliant Emeli Sande’ on January 15th before I leave for London. Emeli is a unique and exceptional organic talent that I have been touting from the very beginning. The broader public in the States is probably most familiar from her performances at the opening and closing ceremonies of the 2012 Summer Olympics in London, resulting in the biggest selling album of the year in the UK. Adrian has done a remarkable job in keeping Emeli above the fray and letting her be herself, much as Richard and Jonathan have done with Adele. I couldn’t possibly more highly advise lovers of real talent to support this singer. The Old, The New, and No Parking! 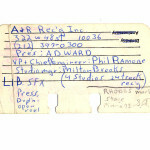 My A & R Rolodex Card from 1979. Note: Phil Ramone’s legendary A & R Studios in Mid-Town Manhattan were in the building at the corner of 52nd St and Seventh Ave that was torn down to build the Equitable Tower. 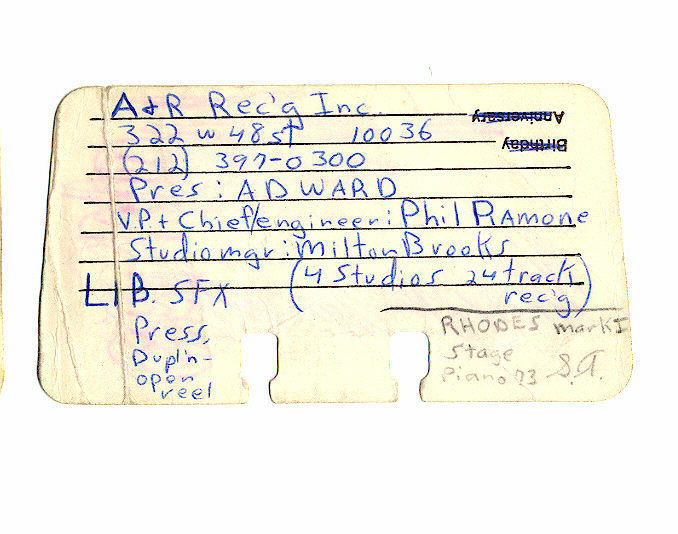 When I was still a teenager I went to New York City in a quest to meet the Great Phil Ramone because at the time I thought in my teenaged head that I was going to be the next Billy Joel, and who better to help me than Phil. When I walked into the administrative offices of A&R Studios, which were at 322 W 48th Street back then, I guess my blind naivete must have been oddly charming or else they thought I was someone else because they sent me over to the studio at 52nd Street and Seventh Ave. Of course I just thought this was normal at the time, and only looking back realize how absurd it was for them to just send me over. This was the first time I was going to step foot in a real recording studio in my life. This famous studio had played host to Sinatra and Streisand before Phil took a Billy Joel who was all over the place and focused him into …well… Billy Joel. When I entered the lobby on the ground floor on Seventh Avenue it was really dirty and there were cardboard boxes thrown everywhere. There was trash on the stairs as well and I started to wonder if I was in the right place. Then I saw a small display case with fogged up glass that contained Phoebe Snow and Steve Forbert albums, one of which had fallen inside the case. I knew I must be in the right place now and I started to get a serious reality check. When I went up the old elevator to the studio they told me that Phil was not there but out of town. I told them the offices sent me over so they offered to show me around. The place seemed old to me. Could Sinatra have really laid down tracks here? …And Billy’s records which were still all over the charts at the time? It was a real eye opener, and the reality of the place compared to what had been in my head, taught me my first great lesson about the music business. Fast Forward: The first time I set foot in Number 2 Studio at Abbey Road I literally got down on my hands and knees and kissed the parquet floor. The same floor that has been in there for decades and was present on June 6th 1962. I excused myself to Samantha (then the head of Abbey Road Interactive) who took me down to Number 2 that morning. The studio smelled old to me and looked smaller in person. The old blue double entry doors are the same. Could this really be the room the greatest songs in history were recorded in? Both A&R Studios, and Abbey Road number 2 produced many of the greatest recordings in history, both were/are not technologically advanced, were/are old, and they had/have NO PARKING. Many new multi-million dollar studios with fresh paint, lost of extra room, cutting edge technology, a bottomless checkbook, and “Plenty of free parking”….. come and go out of business quite frequently ! They usually die a downward death right from the day they open. Even with all the hired spin to say its not really so……the business dies. While Abbey Road Number 2 is booked solid 365 at top rates, and continues to put out hits. Abbey Road endures because it has “It”…..and money can’t buy “It” and you can’t fake “It”, and spin can’t save you if you don’t have “”It” and Free Parking has nothing to do with having “It”.